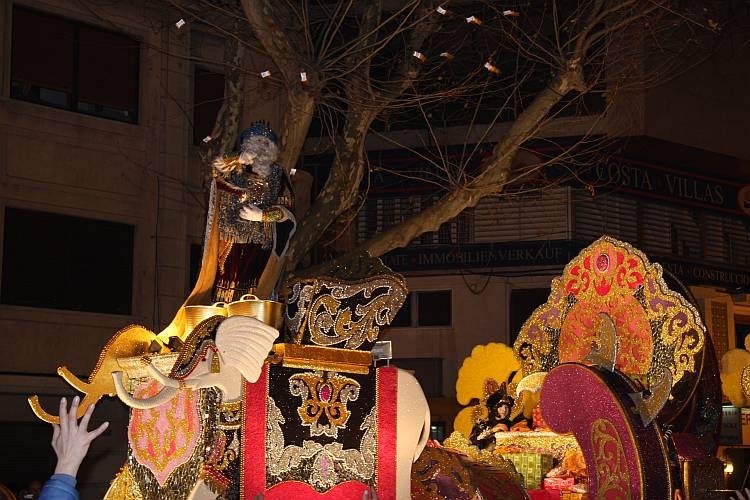 Along with Santa, many houses in Spain over the “holiday period” are decorated with effigies of the three kings climbing ropes to deliver their presents. Whilst Christmas and Santa may be more traditional for us northern Europeans, January 5th and 6th are, I believe, traditionally the main seasonal celebration for the Spanish. The Spanish children, however, have spotted that their northern European friends get presents on Christmas Day so now, both are celebrated. 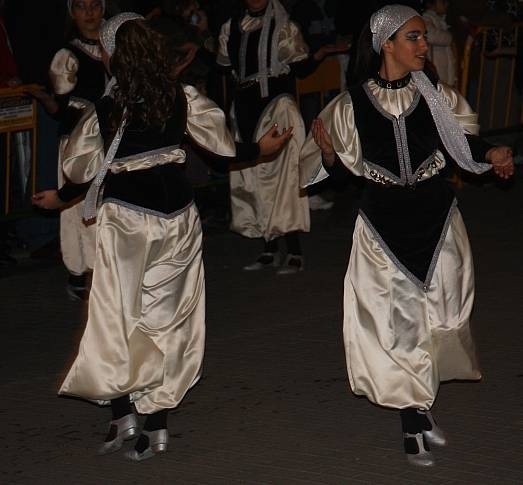 Many towns and villages seem to stage a Three Kings procession but we’d been told that Deniá put on a good show so we chose that as our destination to watch the festivities. 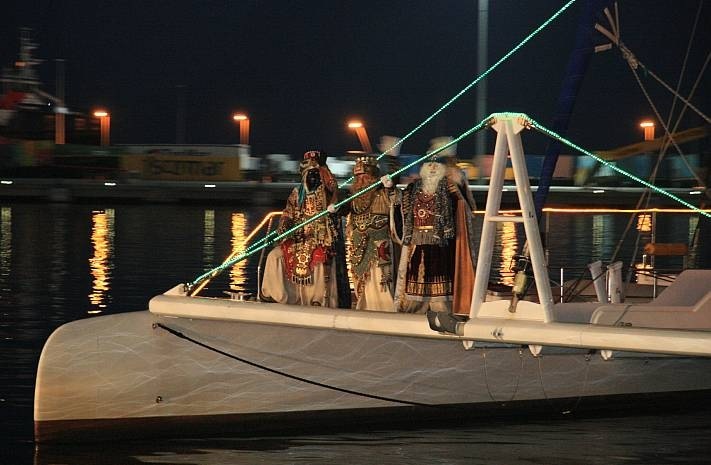 One of Deniá’s appeals was that their Three Kings supposedly arrived by boat to begin their procession at the harbour. Carol had tracked down the tourist office and been given details of when and where the fun would happen and we were looking forward to witnessing a Spanish tradition in the company of Chris and Yvonne who had also expressed an interest, especially as they had volunteered to drive and, more critically, park. The four of us set off just before 5:00 PM for the 30 minute drive. As we drove along the front, parking spots were, of course, already full and a few crowds were beginning to gather. However, Chris found a free space in a side street and we sauntered back to await the arrival of the Three Kings. At about 6:30 PM, a brightly lit catamaran slowly made its way into the harbour and eventually delivered Melchior, Balthazar and Gaspar safely to Deniá, to the evident unbridled delight of the local children, and it seemed, some of the adults, too. Although a modern catamaran might have seemed very out of place, the costumes were excellent with brightly coloured robes and, where appropriate, black face paint. I’d been expecting three guys dressed as kings to make their way up the main street in Deniá to the town square but the actual scale of this surprised me. 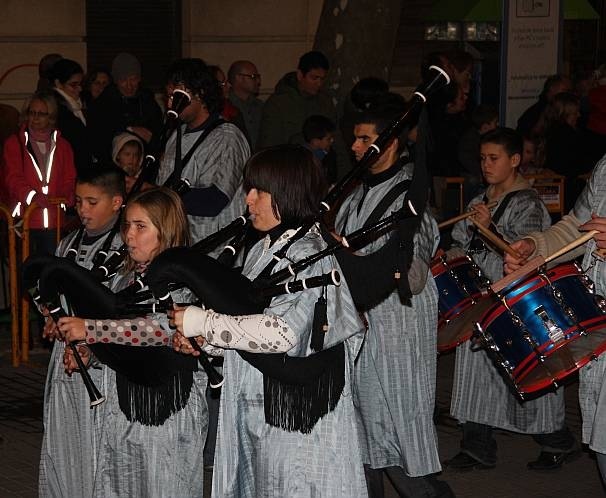 We were treated to a full-blown carnival procession with each of the kings riding a very brightly decorated carnival float, groups of dancers, bands of musicians [aside: I hesitate to describe any noise emanating from a bagpipe as music; what are they doing in Spain? 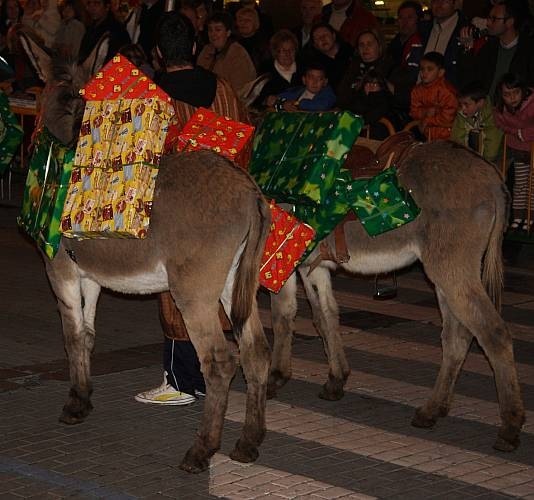 ], horse riders and donkeys laden down with brightly wrapped boxes. 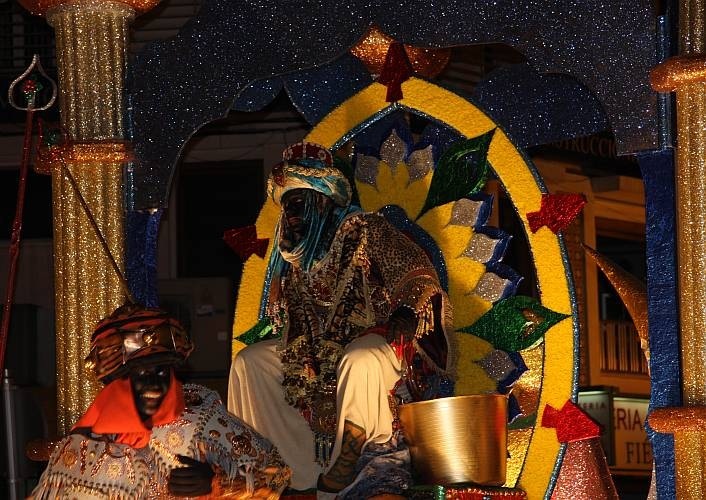 As the procession made its way along the route, the kings, together with a couple of assistants each, were continually flinging fistfuls of sweets into the crowd with the people sparing no effort to retrieve them before others. It was quite a scrum. I was trying to shoot photographs blind, over the heads of the crowd while Carol, much more sensibly, found a step behind the crowd in a shop doorway and did much better with a bit of space. It was a little manic at times and the crowds were larger than we usually like but it was a terrific spectacle which we all enjoyed – well worth witnessing. We returned home for a later snack than usual at about 8:30 PM.